Councilman Bob Weiner and State Representative Tom Kovach joined forces with 21st Century employees early on Tuesday morning August 31 on Shipley Road in front of Springer Middle School. 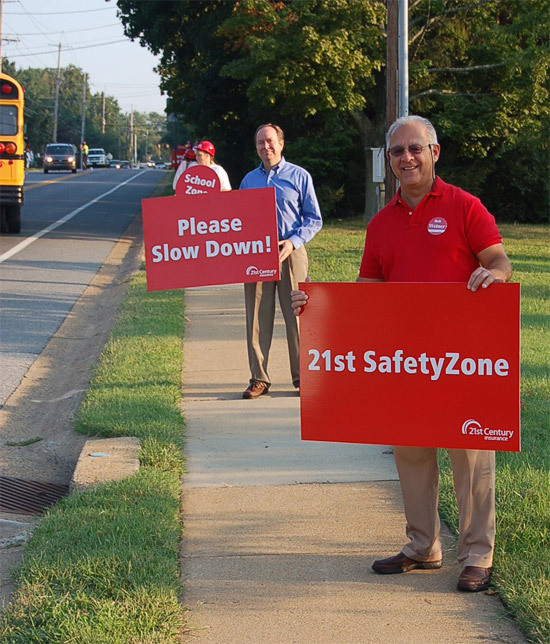 Bob and Tom helped promote a program called 21st SafetyZone, prior to the start of the school morning to get drivers to slow down in school zones. Collectively, we targeted Lancashire Elementary on Monday, August 30 and Concord High School, Talley and Springer Middle Schools and Lancashire Elementary School on Tuesday August 31. For details, contact Jaynine Warner, Manager, Communications & Community Events, 21st Century Insurance, 3 Beaver Valley Road, Wilmington DE 19803 phone: 302-252-2115.